Aer Lingus is now owned by the same parent company as British Airways and they just formed their new program called AerClub using the familiar “Avios” currency. There has been some doom and gloom in the past few days as it appeared the famous ‘sweet spot’ from Boston to Dublin (and Boston to Shannon) for only 12,500 Avios one-way in economy (25,000 round-trip) was being massively devalued in a somewhat sketchy manner. That’s roughly 4 months of peak time, which leaves an amazing ~8 months for an “off peak” schedule. So during those 8 months the devaluation is only 500 Avios each way. That’s an irrelevant increase in my opinion. During the peak times (mostly summer), the increase is a much more significant 7,500 Avios each way. Fights to Ireland from these airports were previously 20,000 Avios one-way, but the wonderful change is that they now qualify for the ‘off peak’ award chart! So that means one-way flights the eight months detailed above as off peak are now only 13,000 Avios (26,000 Avios round-trip). That’s absolutely incredible! Notice that sneaky “exception” at the bottom! As noted above, the first six cities fit into Zone 5 and the final three cities are Zone 6 on the award chart. 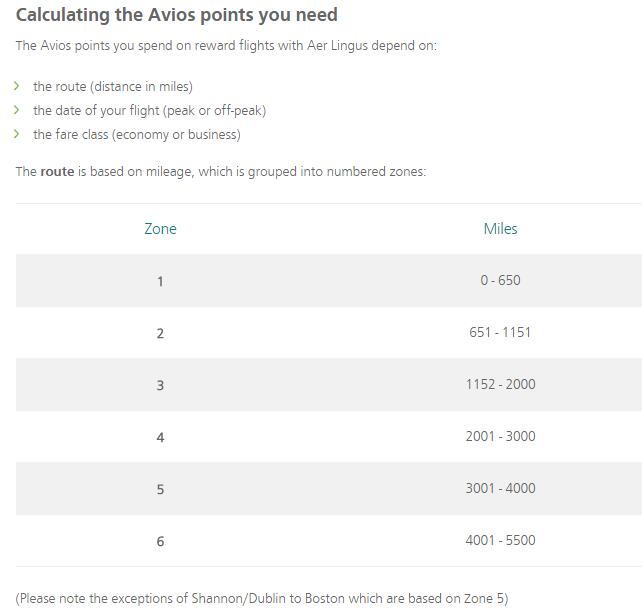 One of our Travel Miles 101 community members booked an Aer Lingus flight to Boston on 12/8/2016 using British Airways Avios and they were charged 26,000 Avios for the round-trip flight, so we are 100% certain that this off-peak chart is currently in effect. It’s time to take advantage of these brand new sweet spots!! Note: As we mentioned in our now outdated article on the 25,000 Avios sweet spot to Dublin, you cannot book these Aer Lingus flights on the BA website, instead you have to call BA. Follow the directions in the 25k article to find award availability and book the flights. Could we use the aerclub award chart for partner flights, like on BA or others, if any. 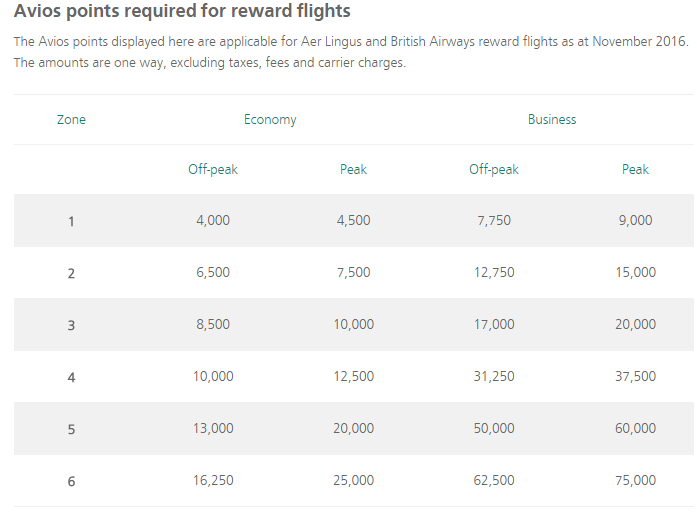 It is still not clear to me how this is all going to work, but I think it would stand to reason that if you had Aer Lingus Avios in your AerClub account that you’d be able to use them on partner airlines. Most people don’t have AerClub Avios at the moment, so that’s largely moot. Wow, they really sucker you on the economy/business.. 13k for off-peak econ, 50k for business. It’s still better than many others but jeeze. I’ll be able to use nearby Dulles instead of flying to Boston now. This might be an even better savings as I won’t have to use miles or money to fly to Boston now. Great to hear thanks for the info! Brad, The Great Circle Mapper shows LAX – LHR as 5456 miles. Does this mean I can get to London for the same 32,500/person?? Please forget my question. Went back to your class on avios miles and got the answer. Thanks for the amazing class. sorry for the slow reply Paige! Glad you enjoyed the course so much and that you figured this out. As of 12/28/2016, I was able to book IAD-DUB round-trip for 2017 off-peak dates (Aer Lingus schedule) using 26,000 avios plus taxes and fees by calling BA. I booked 2 sets of tickets so it was 52,000 avios plus $226.70. I’m not sure if BA is changing reward policy but originally I was told it would cost 80,000 avios because all partner airline tickets are charged at peak rate. I believe BA, Aer Lingus, and Iberia are in the same group and they may not be considered as “partner” airlines like American Airline. Wanted to report back and confirm that I was able to successfully book flights from Chicago to Dublin using this method. I booked roundtrip flights for my family of 4 and it cost 104,000 Avios (13k each way ->26k roundtrip X 4 people) plus about $450 in taxes/fees. The BA agent was very friendly and immediately offered to waive the phone booking fee. Overall a pretty great value! Thank you for continuing to post about redemption opportunities like these! awesome news Connor — congrats and thanks for letting us know!!! Also wanted to check in and say I was able to book 2 round trip tickets from SFO to DUB for 65K total miles and $226.50 in taxes. Amazing!!! I tried for several days to fly out of LAX. I could see one flight on the United’s site, so I spoke to 4 agents over the days, and not one of them was able to find that flight, for miles, even with the fight number, so we just opted to fly out of SFO, where there were still options available. The agents were all very nice and the person who booked my flight was great, waived the phone fee before I even asked. I’m planning to fly myself and two daughters from Newark to Dublin, which SHOULD be 13,000 Avios each (total of 39,000 Avios, plus about $16 in taxes/fees) … but whenever I plug in the info, I get a “quote” of 78,000 Avios plus more than $600 in taxes/fees 🙁 It seems to automatically book the flight as round-trip … is there any way around this? 1.) I was worried calling the BA number would be a full night of waiting, but to my pleasant surprise, I was only on hold for ~10min before speaking with a representative. (Very helpful, as evidenced above.) I might have had a biased experience, as I called ~5min before the 8pm EST closing time, but it worked great. 2.) The flights I was looking for were shown on united.com (not on the BA award search, as mentioned in the previous post, since it’s only for BA and not partners), but in my exploring, I did discover the Avios.com site that would seem to have the ability to search all Avios award availability. Originally, I thought I could login with my BA Executive Club credentials, but that didn’t seem to work. On the Avios.com site, I went to the Great Britain-English version of the website and found a live chat function. The rep there told me I could gain access to Avios.com if I opened an Aer Lingus AerClub account. I opened the account, and sure enough, was able to use that login information to get access to the Avios award availability search. (I didn’t do too much searching, since I was on a mission to book my specific flight, but presumably, you’d have more luck searching all Avios award availability, through more of the partners — e.g. Aer Lingus, BA, and Iberia.) The positive side of this site is that it will give you the actual Avios required (i.e. it showed that I would need the 52k Avios for the flight I wanted to book), very helpful for a beginner like me. Unfortunately, it over-estimated the fees required ($431), which I was suspicious about, since I’d heard about fees for 2 roundtrip flights being closer to the $200+ mark. Luckily, calling the BA number did have the lower fees. But overall, I feel like the Avios.com search may come in handy for partner airline award availability searches. Loved your article and just used it. Signed up for a Starwood Card with your link as well. I just hung up and booked Aer Lingus for IAD to DUB for 13k Avios miles. Then DUB to NAP for 8,500 Avios miles. It looks like the zones priced correctly but I thought the 8,500 looked high based on the first flight being 13k. Did the British Airways agent/system price this correctly for the Aer Lingus flights or am I looking at it wrong? My daughters and I are flying DUB-EWR in June for 13k each (one way), which is great … but I’d be happier if they’d open up some business seats 🙁 U.S.-Europe economy fares are getting so cheap that I hate spending miles on them, but business/first availability is almost non-existent. Is the best route to reduce fees to go through British Airways call center? Checked online at avios, and Chicago-Dublin fees are quite steep.